This week, Arizona Gov. Doug Ducey ordered Uber to stop testing self-driving cars in his state, after one of the company’s cars fatally struck a pedestrian, the first known pedestrian casualty to involve an autonomous vehicle. But that abrupt decision followed years of Ducey actively courting the company—so much so, he even let Uber secretly test autonomous cars without telling the public as far back as 2016, according to emails obtained by The Guardian. Ducey’s already pushing back on the report. They reveal how Uber offered workspace for Ducey’s staff in San Francisco, praised the governor lavishly, and promised to bring money and jobs to his state. 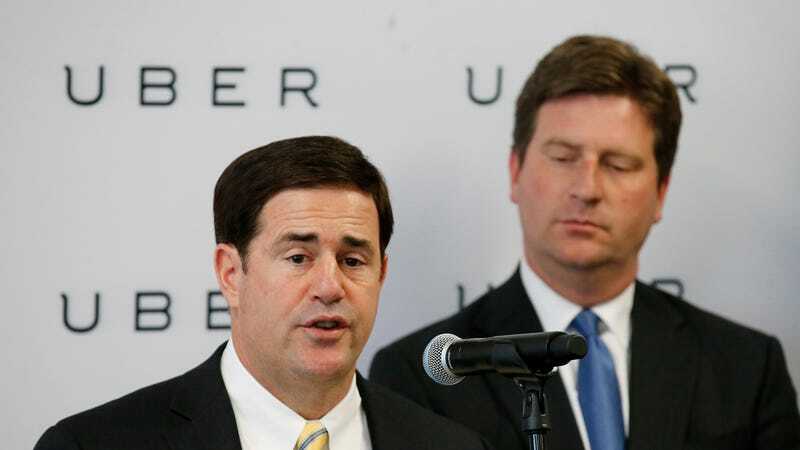 Ducey, meanwhile, helped Uber deal with other officials in Arizona, issued decrees that were friendly to the company, tweeted out an advert at the company’s request, and even seems to have been open to wearing an Uber T-shirt at an official event. Ducey’s made it clear in the past that he loves Uber, and after the company abandoned California in late 2016, he proclaimed that Arizona welcomes it with open arms. Why? Because Uber didn’t want to pay the necessary $150 for a permit to test in California. So Uber migrated to Arizona, where, The Guardian found, he let the company begin testing self-driving cars without telling the public. That’s apparently because his regulation-free zone allowed it. On 19 August , [head of policy development at Uber Ashwini] Chhabra wrote [Danny] Seiden, the governor’s deputy chief of staff, to let him know that “starting this weekend” Uber would “start testing some self-driving functionality”. It was an innocuous-seeming email that in fact announced a major precedent. “There will be safety drivers at the wheel, so won’t look much different from what’s already been on the road but wanted to flag it for you nonetheless,” Chhabra said. Remarkably, the public appears to have been kept in the dark. Because of Arizona’s regulatory vacuum, neither Uber nor Ducey were obliged to inform the public that Uber’s cars would now be driving themselves on public roads. Neither, it seems, did they believe they had an ethical duty to do so. The emails are bound to raise significant questions for Ducey. But the governor’s office says the emails falsely portray the situation in Arizona. Daniel Scarpinato, a spokesperson for the governor, said the suggestion that Ducey failed to tell the public about testing is “completely false, and we absolutely reject in every way the suggestion this was not done in a transparent way.” For example, Scarpinato said the governor’s initial executive order that allowed self-driving cars to be tested in Arizona was signed a year prior to the email cited by The Guardian. Don’t be shocked when you see the car next to you speeding down the freeway with no one’s hands on the steering wheel. Or no one behind the wheel at all. Self-driving cars are already being tested on Arizona roads. But as The Guardian points out, Ducey’s office declined to explain to the publication why it chose not to specifically publicize Uber’s tests, and Uber confirmed it didn’t make a public announcement because it was focused on launching a pilot program in Pittsburgh. Whatever the case, surely, the emails—and The Guardian’s entire story—will raise some questions about Ducey’s welcoming attitude toward the autonomous car industry and this company in particular.